The DJ collective will be in Europe throughout August and September. 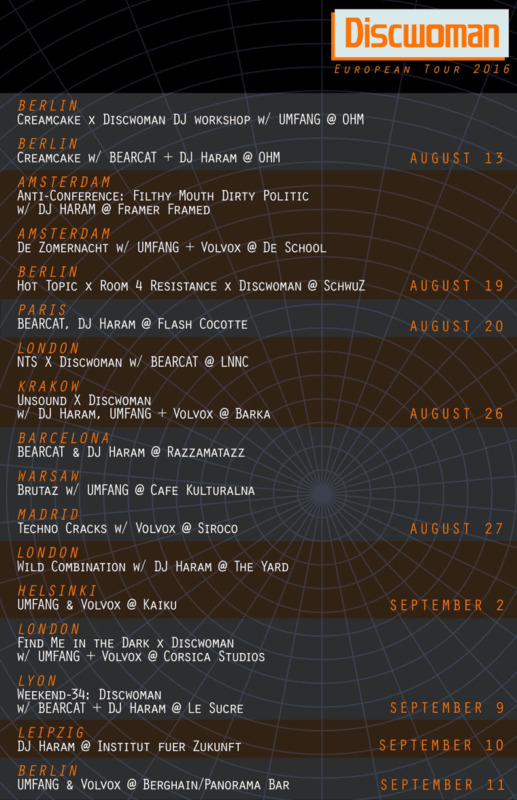 DJ BEARCAT, DJ Haram, UMFANG, and Volvox will be on tour in Europe for the next month. The collective will visit Berlin, London, Paris, Amsterdam, Barcelona, Madrid, Krakow, Warsaw, Helsinki, Lyon, and Leipzig on the trip. In addition to the clubs and nights that they will play at, Discwoman will also be taking part in a female and LGBTQ-only DJ workshop in Berlin on August 13. They'll also be taking part in a panel discussing “How to bring politics (back) to the dancefloor?” with Hot Topic and Room 4 Resistance at Berlin's SchwuZ on August 19. Check out their full itinerary above.